Use of inorganic nanoparticles for the development of high-performance polymer nanocomposites is a common practice in polymer nanotechnology, because the decrease in particle size to smaller scale greatly influences the optical and magnetic characteristics of the resulting materials. 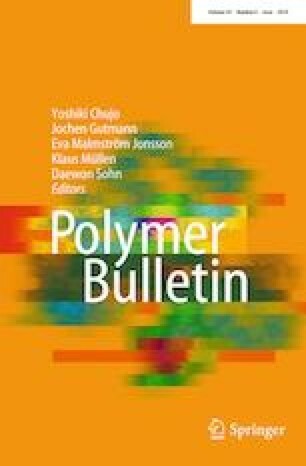 In this work, synthesis and characterization of polymeric nanocomposites based on poly(p-phenylenediamine) and metal oxide nanoparticle are described. ZnO, Fe3O4 and TiO2 nanoparticles are used for the synthesis of the nanocomposites. In situ chemical oxidative polymerization method is employed in the presence of hydrogen peroxide as oxidant and cis-bis-glycinato copper (II) monohydrate as catalyst. Structural characterization is performed with FTIR, UV–Vis spectroscopy, thermogravimetric analysis, X-ray diffraction and also transmission electron microscopy. Morphological analysis reveals amorphous to semicrystalline nature of the polymer nanocomposites. Thermal characterization indicates the stability up to a temperature of 150 °C. Electrical conductivity is found in the range 10−10 S/cm for the polymer and 10−7 S/cm for the polymer nanocomposites, which falls in the range of semiconducting materials. Study of magnetic properties using vibrating sample magnetometer (VSM) technique reveals that Fe3O4 nanocomposite exhibits enhanced soft magnetic properties as it is clear from the coercivity, retentivity, magnetization and moment. Thus these polymeric nanocomposites are expected to find application in magneto-optic field as well as in organic light-emitting devices.